Niall McDiarmid’s book Crossing Paths starts from a simple premise: one quiet Sunday in the winter of 2011 he walks to the station, catches a train, and starts taking photographs of the people he meets. He carries on like this, criss-crossing Britain, for three years. 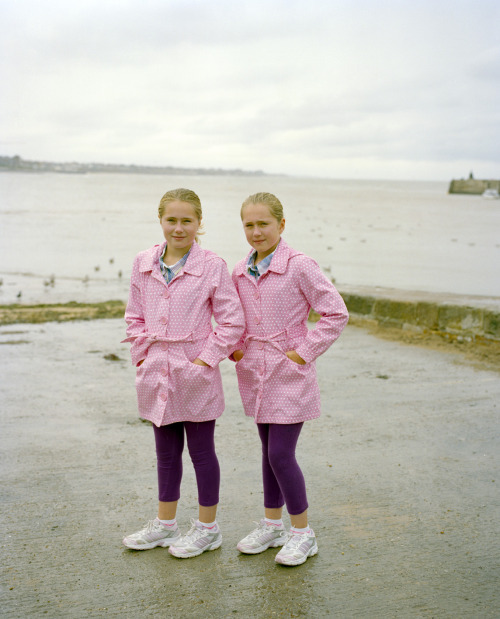 On a damp, overcast day in Margate, he takes this photograph of twin sisters in identical outfits – a swirl of candyfloss against the grey. Photographers seem irresistibly drawn to the subject of twins, one which can easily descend into cliche. Diane Arbus’ Identical Twins, a photograph of seven year old twin sisters can barely be mentioned without the words ‘uncanny’ or ‘spooky’, while Roger Balen’s Dresie and Casie presents mentally and physically handicapped twin brothers as outlandish and grotesque, (photojournalist Herman Verwey wrote a touching riposte here Two, kindly, jovial fellows). However McDiamird’s portrait of the twin sisters is a much gentler affair. He has a sharp eye for colour and composition and it’s all the better for the double melancholy of a rainy day by the seaside. Photographic portraits invite us to stare much longer than might be comfortable in real life, and here it’s about noticing the slight differences, how they each stand and present to the camera, their expressions and positions – but ultimately it’s all about two sisters. There are a multitude of people in McDiarmuid’s book Crossing Paths, and each portrait sets us off to puzzle over who they might be, who they remind us of and occasionally to wonder if we might even know them – it’s a delightful journey. Although Crossing Paths is currently sold out, McDiarmid’s new book Via Vauxhall is due to be launched in March 2015.